Since 2011, researchers at the Cluster of Excellence Cognitive Interaction Technology (CITEC) have been working on Billie, a virtual voice assistant. The avatar is part of Kompass, a research project that stands for “socially cooperative virtual assistants as everyday helpers for people with special needs.” All projects arose in cooperation with the v. Bodelschwingh Foundation Bethel. By notifying them of their appointments or reminding them to take their medication, Billie can help individuals with disabilities or cognitive limitations to master their daily lives – on their own. A new Video presents Research on Billie the Virtual Avatar. “At this point, Billie has basically become the face of the cooperation between the v. Bodelschwingh Foundation Bethel and the Cluster of Excellence CITEC,” says Professor Dr. Helge Ritter, who serves as coordinator of CITEC. “This year, Bethel is celebrating its 150th anniversary, and for this, we offer our warmest congratulations. In addition to Billie, we have other interesting projects in which the human stands at the forefront, and technology is accessibly integrated with the user as much as possible.” The research apartment KogniHome is one such project that emerged from this cooperative relationship. Cora – Billie’s sister, so to speak – is integrated in the smart apartment. Cora helps its residents to find events, gives the weather report, or provides the bus schedule. The smart apartment can be visited on 24 August 2017 as part of Bielefeld’s Geniale science festival (the apartment is located on the Gadderbaumer Straße 41). 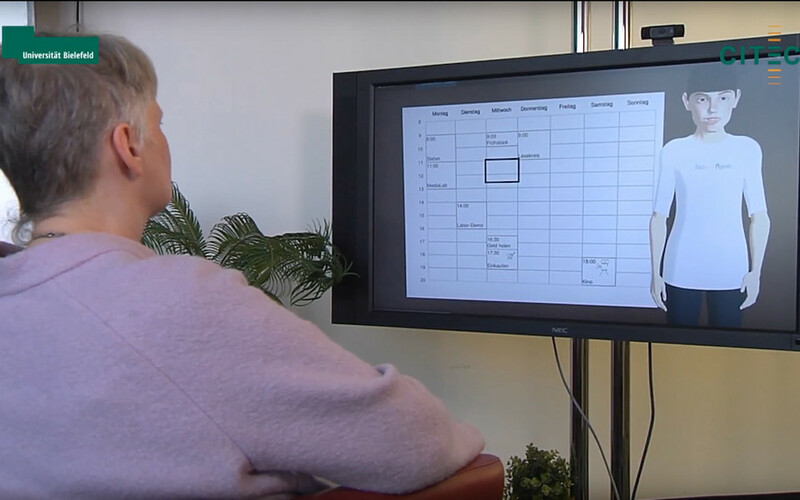 “The virtual assistant Billie is meant to be a new kind of helper for people with cognitive difficulties who require support – that is, people who are not able to deal with the day to day on their own since they may, for instance, lose sight of their daily schedule,” says Professor Dr. Stefan Kopp, who heads the Social Cognitive Systems Group. “Today, we have many technical capabilities, but accessing them is not possible for entire user groups. Billie can bridge the digital barrier for these people.” The avatar is easily operated with speech input, and it can converse directly with the user. Operating the avatar is so intuitive that Billie is quickly accepted as a helper: study participants have described its assistance as pleasant and supportive. Already after a short period of time, Billie becomes a kind of caregiver, who can help make it easier to maintain contact with friends and acquaintances. “We look at speech-operated systems and ask ourselves: how can such systems support the user? Of course it can always happen that either the user or the avatar misunderstand something,” says Ramin Yaghoubzadeh, who is a member of Stefan Kopp’s research group. “Billie is designed to be able to react to language barriers. It can understand, for example, when a person doesn’t say ‘yes’ or ‘no’ clearly – something like just ‘mmh’ or ‘nah.’ The user can also interrupt the system or cut Billie off mid-sentence.” Billie gradually learns how to speak with a human and how to deal with linguistic vagueness. In case of doubt, Billie just asks for clarification or says that it didn’t understand something. This is the only way that the system can do exactly what the user actually wants it to do. “Billie was specifically planned to be a personal assistant,” says Stefan Kopp. “He knows the user’s preferences and is always learning more about them.” Currently, a large user study is being conducted in the apartments at the v. Bodelschwingh Foundation Bethel. Billie therefore wasn’t born on the drawing board, but has emerged from the real needs of users, which are taken into account during development. In addition to the v. Bodelschwingh Bethel Foundation, the University of Applied Sciences Bielefeld and the University of Duisburg-Essen are also participating in Kompass.